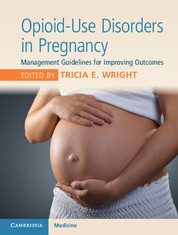 Our very own Dr Tricia Wright is the editor of a new book about opiod-use disorders in pregnancy and management guidelines for improving outcomes. You can get it on Kindle now, or pre-order it in paperback. This book will help readers gain vital guidance and support when treating the high-risk, high-reward population of women confronting (or battling) opioid-use disorders during pregnancy. Large numbers of pregnant women are dependent on opioids and require comprehensive non-judgemental care to replace traditional approaches of incarceration and child welfare involvement that worsen outcomes for both mother and infant. Invaluable and comprehensive, this toolkit provides the key to non-judgemental care for both mother and baby, throughout labor, delivery management and postpartum care. It bridges the important treatment gap through evidence-based, caring approach; standardizing exceptional care, for obstetricians, pediatricians, addictionists, and anyone caring for pregnant women with opioid-use disorders. Edited by a Board-certified expert in obstetrics, gynecology and addiction medicine, and a team of internationally-acclaimed leaders in women’s health, this guide provides high-quality advice, guidelines and vital skills to tackle a currently expanding opioid epidemic. Tackles a timely subject manner, providing readers with current management guidelines for this challenging patient population and growing epidemic. I’ve had the privilege of editing this book with national and international experts in caring for women and children affected by opioid use disorders. It was the main project during my tenure as chair of the Women and Substance Use Disorder Workgroup at the American Society of Addiction Medicine. The authors are a diverse group of obstetricians, pediatricians. addiction specialists, family medicine, psychologists, and psychiatrists from around the country. Some of the authors include Loretta Finnegan (of the Finnegan score for neonatal opioid withdrawal), Hendree Jones (the main investigator of the MOTHER study-the first randomized control trial of methadone vs buprenorphine in treating pregnant women), Mishka Terplan, Stephen Patrick, Karol Kaltenbach, Rich Soper, Larry Lehman, Jacqueline Starrer, Kaylin Klie, Margaret Chisolm, Soraya Asadi.